John Newcomb Boyett (born December 20, 1989) is an American-born Canadian football safety for the Ottawa Redblacks of the Canadian Football League (CFL). He was drafted in the sixth round of the 2013 NFL draft by the Indianapolis Colts. 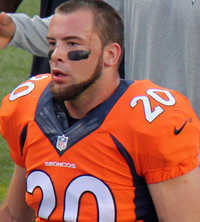 Boyett has also been a member of the Denver Broncos, but has not played in the National Football League due to several legal incidents. This webpage uses material from the Wikipedia article "John_Boyett" and is licensed under the GNU Free Documentation License. Reality TV World is not responsible for any errors or omissions the Wikipedia article may contain.